Other challenge entries for the letter P can be seen in the same parent gallery 'ABC Challenge begun 2018', follow the link below caption and keywords. 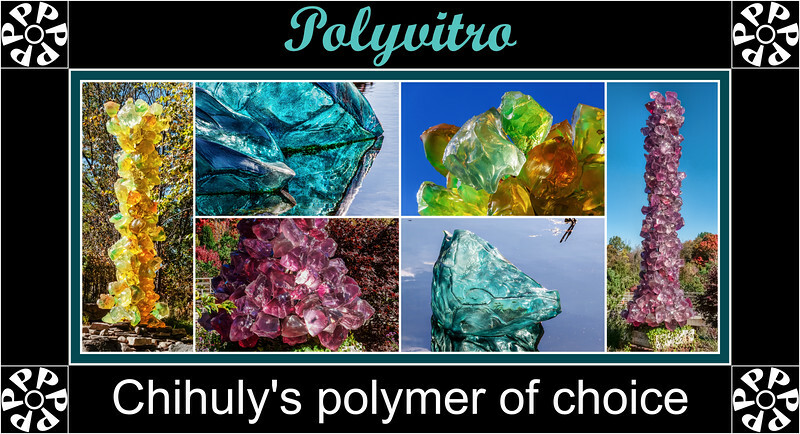 Polyvitro is the name given by glass artist Dale Chihuly to a type of polyurethane polymer he uses in some of his constructions. It is semi-translucent, and can be made in virtually any color. In the 2010 exhibition of Chihuly’s works at the Frederik Meijer Gardens & Sculpture Park, from which the photos in this montage were taken, there were two polyvitro towers, and a large display of ‘floating’ polyvitro ‘icebergs’ on a lagoon. Chihuly refers to chunks of polyvitro, which as far as I can tell are cast and solid rather than blown and hollow like his glass forms, as “crystals”. However, being polymeric in nature, they aren’t true crystals. Stunning collage and individual shots! LOVE the work on the corners! Gorgeous : these Polyvitro ! !